Launching a website online involves administrative technical procedures. This segment will outline all the steps I took, from registering a domain name to creating and managing a database. To publish a self-hosted website online, I first registered a domain name. 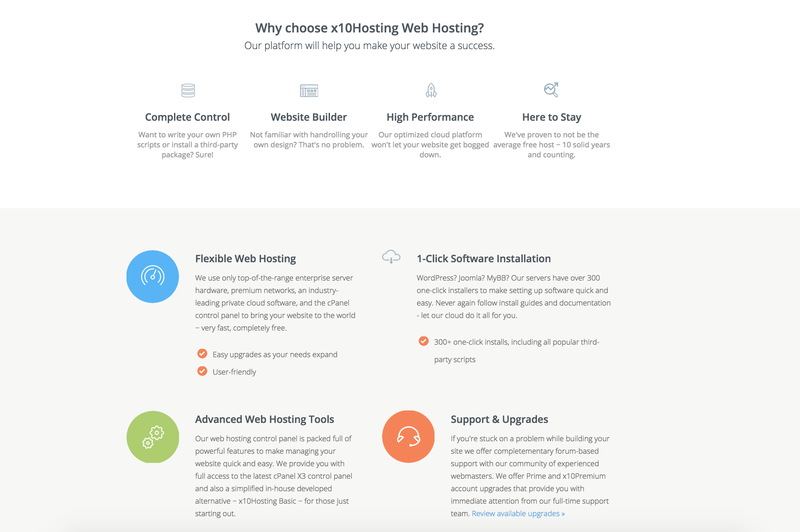 I chose the web hosting organization x10hosting to register my domain name. 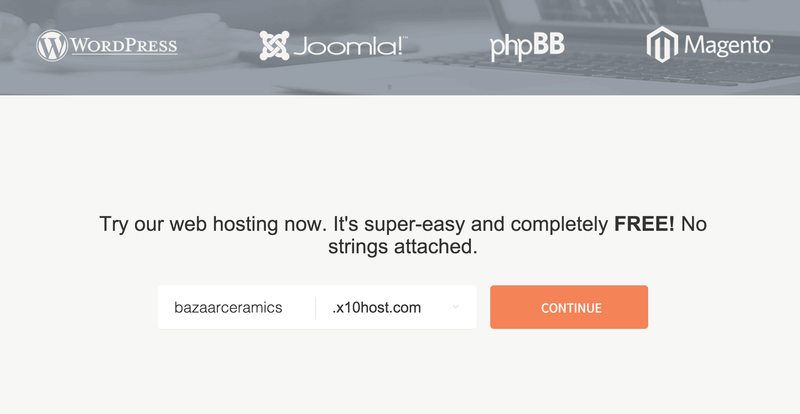 It was an easy process in which I entered the domain name I desired, which was “bazaarceramics.x10hosting.com”. Registering domain name. Image: x10hosting. Once x10hosting confirmed that the desired domain name was available, I entered a new password for the account and entered my personal details. Following this, I have successfully registered a domain for my Bazaar Ceramics website. The domain name under my free x10hosting account is public. By setting up a web hosting account with x10hosting, I am given basic access to the web administration interface. Masked or stealth URL Forwarding: whereby the true URL of the website does not appear in the address bar of a user’s browser. The domain name being forwarded instead appears in its place. The title can be controlled at the top of the browser window. The next step in website hosting is to install a third-party FTP client program to access my website files via file transfer protocol (FTP). 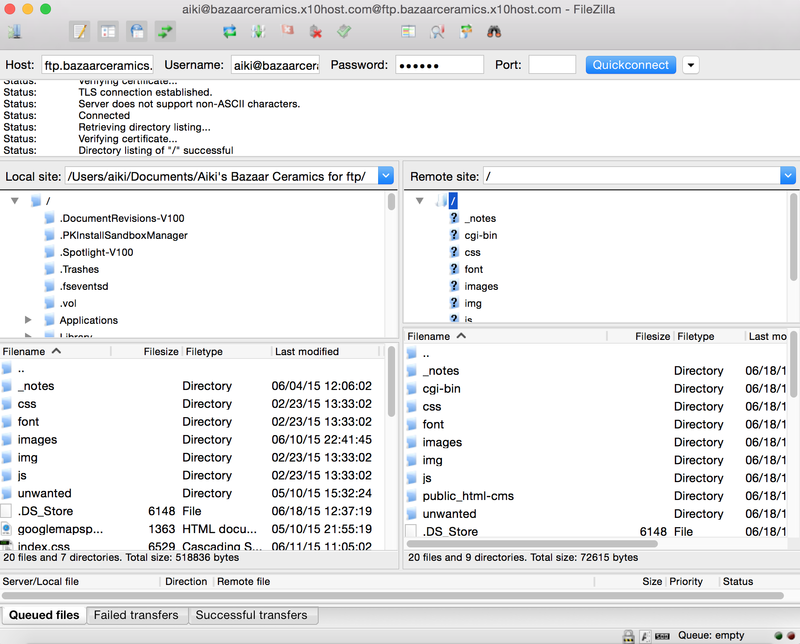 I chose FileZilla as my FTP client program, and installed as per its instructions. 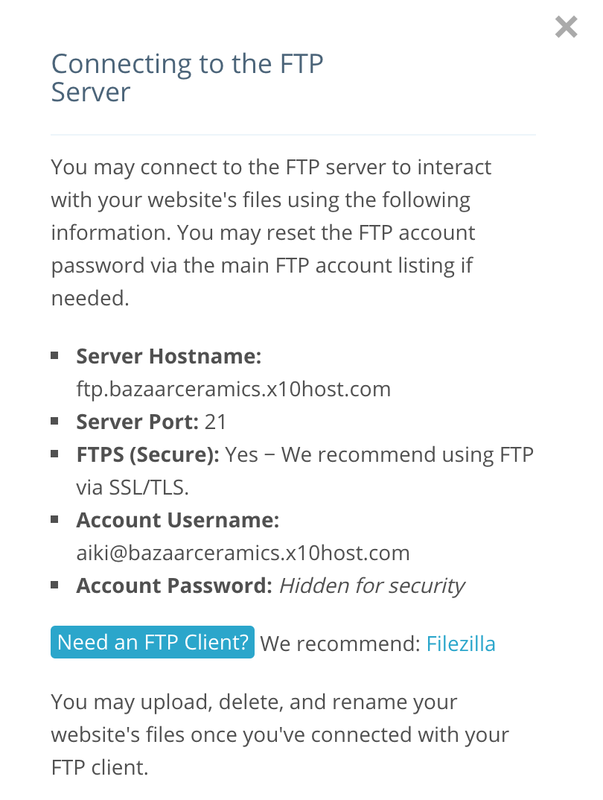 Connecting to the FTP server. Image: x10hosting. On the x10hosting interface, I accessed ‘FTP Users’ and added an FTP user. I recorded username and password details for future FTP procedures. I then uploaded the HTML, CSS, image, and jQuery files for my website to the remote site public directory named ‘public_html’. After the successful transfer and upload of the files (which is indicated in the lower tabs labelled ‘Queud Files’, ‘Failed Transfers’ and ‘Successful Transfers’), I am able to view my website in an internet browser. 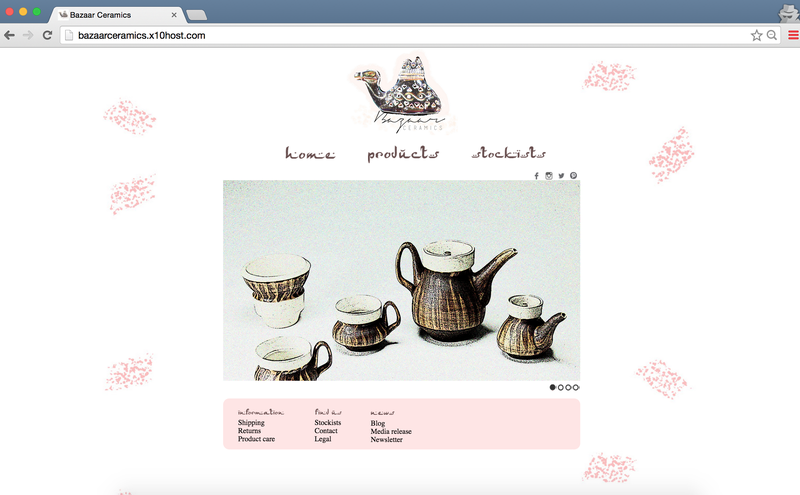 Bazaar Ceramics homepage. Image: Bazaar Ceramics. For more complex e-commerce sites requiring the collection of records, I will need to create a new database. 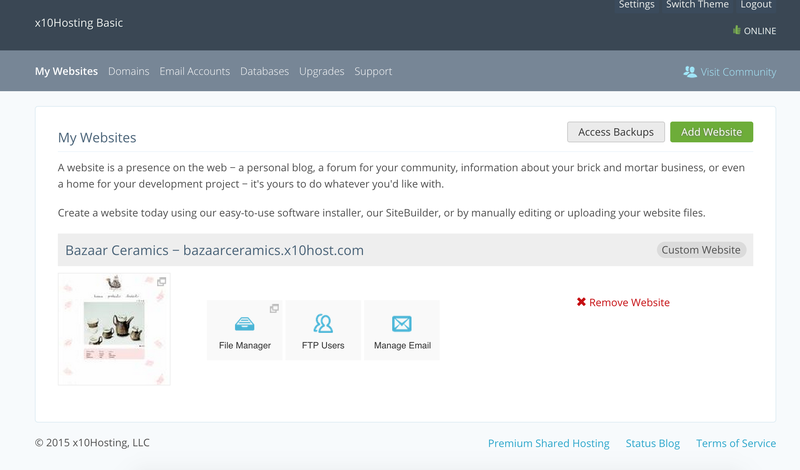 To manage databases on my web hosting account, I accessed the Databases interface on x10hosting and added a new MySQL Database named ‘bazaarce_wordpress’. Add MySQL Database. Image: x10hosting. Transferring my database content from local to remote server involves the same FTP procedures mentioned. I accessed my wordpress folder from my ‘htdocs’ folder on my local server and uploaded the files using FileZilla. I can then modify my database remotely using PHPMyAdmin. My Bazaar Ceramics website hosting is now complete and can be accessed by clicking on: http://bazaarceramics.x10host.com.